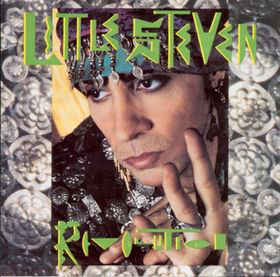 This 1988 album saw Steven Van Zandt reprising the protests he began on the previous years’ excellent, underrated “Freedom No Compromise”. His targets are again the US Government, the right wing media, “newspeak”, the maltreatment of Native Americans. This time, however, the great rock guitar riffs are gone and we are left with a very 1988 hip hop-style synthesiser and drum machine backing with barely a guitar within earshot, which is a shame as Van Zandt is such a great guitarist. 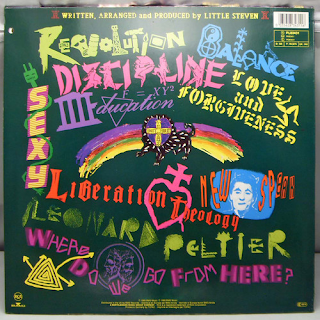 Unfortunately, tracks like “Where Do We Go From Here”, ”Revolution” and “Education” just mesh into each other, Steven’s vocals seeming to lack the verve of the previous outing and buried in amongst a barrage of synthesisers. Some good lyrics here and there, but they seem to have lost the potency and urgency as the ones from before. Steven’s voice seems dull, rather than energised. There is no “Sanctuary” or “Trail Of Broken Treaties” type songs on here. It is as if he made all the points he wanted to make on the last album and he was sort of treading water here. “Love And Forgiveness” has a good vibe to it, though. His voice comes alive a bit and the backing has a bit more variety in places. The sound, due to the production, is rather muffled throughout. Not many tracks differ much from each other, except the excellent “Leonard Peltier” and parts of “Liberation Theology”. “Discipline” has a nice guitar riff (at last - on the last track of the album!) and a good chorus hook. Overall, though, it is very much one those 80s albums spoilt by the overuse of synthesisers. So many groups did it, to their detriment. The album is now impossibly difficult to get hold of. If this is frustrating you, I wouldn’t lose any sleep over it.